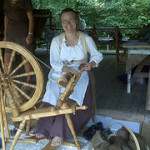 Beth has been involved with various aspects of spinning for many years and teaches spinning classes, does period demonstrations and exhibitions, and sells spinning wheels, felting kits, wool, and other supplies at the farm. The farm attends the Middle Tennessee Fiber Festival each year and also hosts our popular Dye Day event every fall. We also travel to spinning and fiber shows in Tennessee and surrounding states where Beth sells wheels, supplies, and her own custom creations. You can buy wheels and other items at the gift shop here on the farm and we can also have wheels shipped directly to you or deliver to the Middle Tennessee area. Please contact us if you’re looking to buy a spinning wheel and would like to test drive one first at the farm; we’ve got a variety of Kromski wheels and supplies on hand and are happy to let you try one out. Students of our spinning classes also often end up purchasing wheels, with our Intro to the Art of Hand Spinning class a great way to learn about the basics of spinning but also how wheels work and proper maintenance and care. We’re always adding new items to the gift shop at the farm, including many hand-crafted items that we make right here. We sell fleece and wool from our Shetland sheep and also stock Ashford roving for felting and spinning. 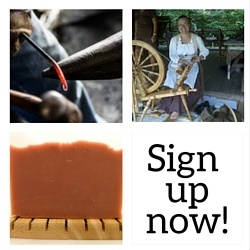 Check out our Classes and Workshops page for upcoming blacksmithing, spinning, and soapmaking classes! We sell a variety of Kromski spinning wheels as well as spinning supplies.